I had the awesome opportunity to review this toothbrush for Modern Mom. Hello? is anyone else obsessed with Brooke Burke-Charvet? I am a bit of a nut when it comes to my teeth. Probably because since I can remember, I have had nightmares about my teeth falling out. No idea why, but it happens on the regular. I also had horrific teeth when I was younger. As in two rows of them. According to my childhood orthodontist I must have gotten a small mouth from one parent and huge teeth from another. Thanks Doc. So I was pretty excited to get this bad boy in the mail and try it out. After convincing my husband to "put it together for me" aka, put the batteries in, read the directions and tell me how to use it, I was all excited to get it set up in my bathroom. I've never used a battery operated toothbrush, so I was a little nervous. I used it for 2 weeks straight and I can honestly say I am in love. This toothbrush is amazing. Let me just quickly go over how it works. It has 5 different modes of cleaning, ranging from massage to deep clean. I spent most of the 2 weeks using the Daily Clean mode and then the Deep Clean on random days. I could not believe how even using it one time, I could feel the difference. Like, with my tongue difference. You know how when you get a cleaning at the dentist your teeth just feel so clean? That is exactly how I felt. My favorite feature is the timed beeping. A Daily Clean will time you for 2 minutes. And every 30 seconds it will beep at you to know to move to another section of your mouth (think 4 quadrants in there). Totally Andrea idiot proof. I also loved that both the brush and the Smart Guide would blink red when you were using too much force. Which is something that I apparently was doing way too much of. Oral-B is also offering a $20 mail-in rebate from now until December 31, 2012. 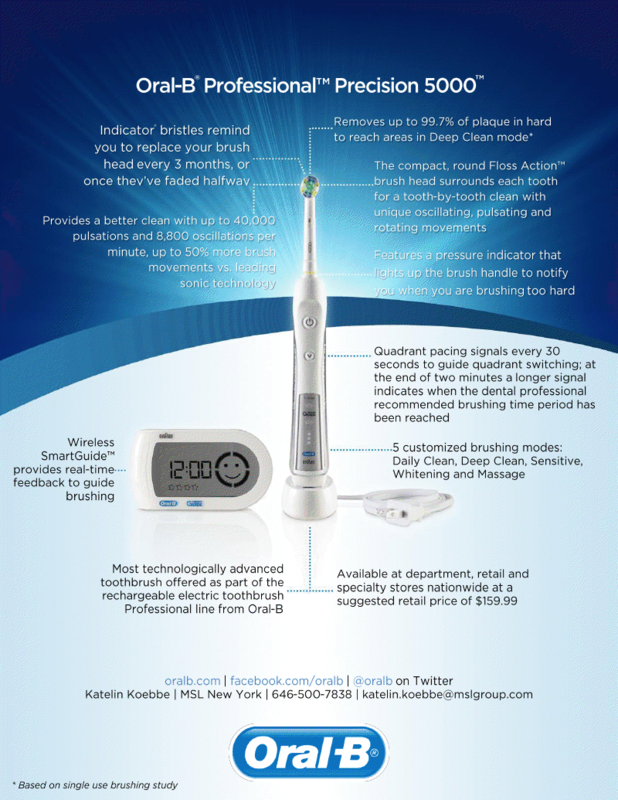 You can go to OralB.com for more information. Make sure to check out Oral-B's Website, Facebook and Twitter!